If nobody can see the bear here, then I will just say that I was going for a nice landscape shot. We went to Waterton on Sunday to test out my new digital camera,(which I am loving.) However, next time I will remember to charge the battery before going. Cropped, color adjust, border added, and resized for TN. A nice capture of your bear....he's almost like " Finding Waldo" he really blends in well to his surrounding. The yellow aspen are a nice compliment to the dark green evergreens. I hope you were close to your car. I was going to say nice landscape and fall colours and then I saw the bear! Good job in capturing him along with the nice scenery. Your rusty brown bear blends with the beautiful autumn colors. Excellent colors of your new camera! Congratulations! Nice clear and sharp. Like the composition very much! This is a lovely shot, nice detail and beautiful colours and light. Magnifique paysage avec ces arbres de diff�rentes couleurs. 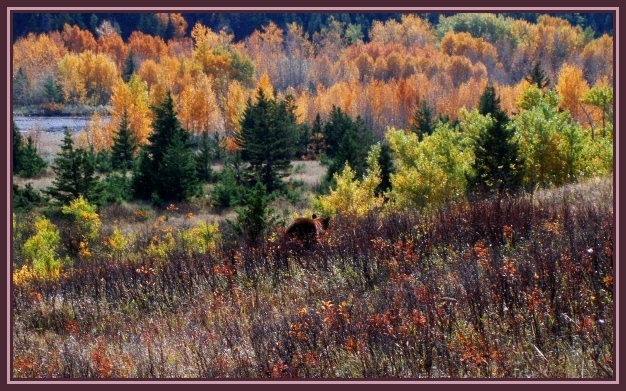 Et en plus un ours, visible au deuxi�me coup d'oeil..
Une merveilleuse photo que ce ce joli paysage avec ses belle couleurs d'automne, le cadrage et les d�tails sont tous tr�s bons. Not a bad shot of the bear, Christan (that's about as close as I'd be willing to get to a grizzly, though I have been much closer to black bears). But this is a wonderful looking fall landscape, too. Great colors. I would like to see it BIGGER! You might also consider cropping a bit off the fg to bring the bear closer and put more focus on it and the trees in the bg. oh yeah, i see him, thank god he�s far enough away. wasn�t that a bit scary? what a beautiful fall scenery. well seen & captured, thorsten. again, some more crap from bottom could change the shot better. Beautiful colors, with fauna as an added bonus.